I love basketball ❤️🏀. To me love means two things - sacrifice and being fascinated by the intricate details. I have created this website to share my knowledge and passion for the game. I hope you find it beneficial. A considerable benefit of playing a zone defence is that it has the potential to cause confusion and hesitancy by the offence - the shot clock is often wasted organising the desired spacing and passing the ball around the perimeter. Contested threes without the ball penetrating the defence often results. To avoid empty possessions versus zone it is important for the offence to be certain, confident and aggressive. As much of the shot clock as possible should be spent attempting potential scoring actions until a good shot results. The more there is positive transfer between the skills, concepts and specific tactics employed against man-to-man and zone the more assured a team will be in attacking zone. This article focuses on how you can apply the concepts outlined in How to Make the Defence Always Wrong - On Ball Screen Offence Versus Man against zone, thereby ensuring positive transfer between your man and zone offences. With proper application you can once again render the defence “always wrong.” If you have not already read the above article I recommend you read it before proceeding with this one. Having malleable bigs like Al Horford or Valencia’s Bojan Dubljevic, and players with vision, are the ingredients that make the recipe work. For the screener it is easier to “Arrive Alone” versus zone as no one defender is responsible for tracking his movement as he goes to screen, however, it is still important that the ball handler has separation as the ball screen arrives. Typically the ball handler achieves this by threatening to beat their defender away from the approaching screen using Change of Pace, Change of Direction, a combination of the two, or fakes. If their defender backs up or their weight goes backwards this is enough for the ball handler to win the race to the screener’s shoulder and hip. It is imperative that the ball handler keeps his vision up - seeing all the other nine players on the court. As with attacking man-to-man, the screener should set the screen on the bottom side of the ball handler’s defender (“Sternum to the back of the Shoulder”) so that the defender can not go under the screen. This allows the offence to develop a 2-on-1 versus the rim protector. This should trigger ball reversal which will achieve the Primary Objective. Versus man-to-man defence if the defensive uses an aggressive on ball screen coverage (trap, hard show, switch) it is recommended to pass the ball to the 2 High. It is optimal if the 2 Side corresponds to the Front Side. * Here the coach has a decision to make: the optimal pass versus man-to-man is to the 2 High, irrespective if it is Front Side or Back Side. The optimal pass versus zone is a Front Pass, irrespective if it is the 1 Side or the 2 Side. In order to teach the optimal pass for both situations the coach will need to manage some negative transfer between the two, which forces the players to think more, and will likely reduce execution somewhat. If the coach believes the negative transfer will be too great he may need to adjust so the teaching versus man and zone is the same - versus aggressive coverage make a Front Pass. 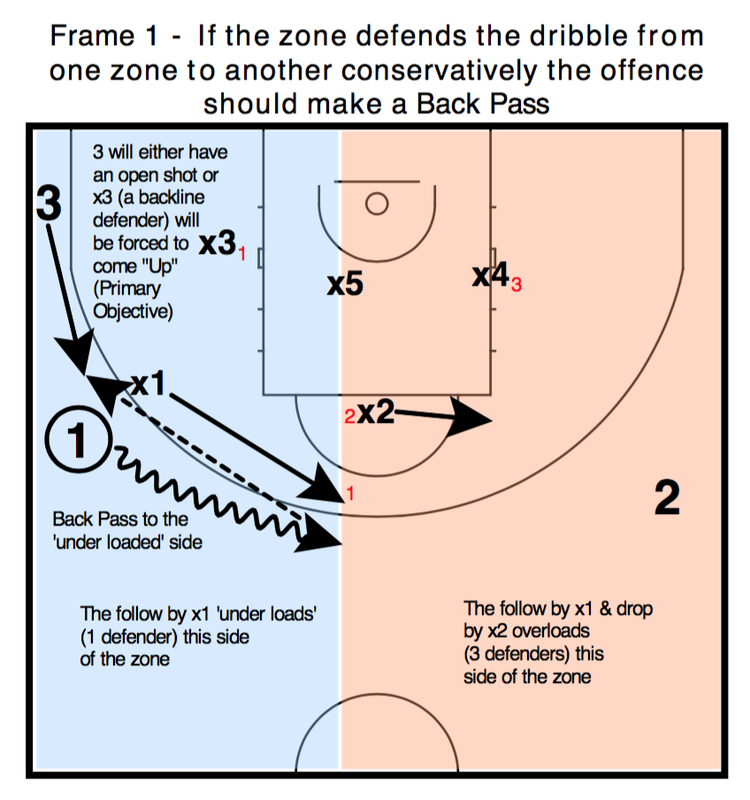 Versus zone defence if the ball handler dribbles around the perimeter, from one zone to another, and the zone defends this movement conservatively by following and dropping, the offence should make a Back Pass. If the ball handler dribbles to score they will either: 1) beat their defender into the middle of the zone, which will force the rim protector to commit. The bigs in the short corners should be able to step into the holes created for a bounce pass or lob pass and a strong finish on the rim; or, 2) their defender will contain them which will pull them out of their assigned zone and also take their momentum away from their next close out. If the zone defends the on ball screen aggressively by switching, the offence should make a Front Pass. The read for the screener is the same as man-to-man, versus aggressive coverage (the defender he screens will bounce off as opposed to fight over) he wants to diagonal roll or dive. 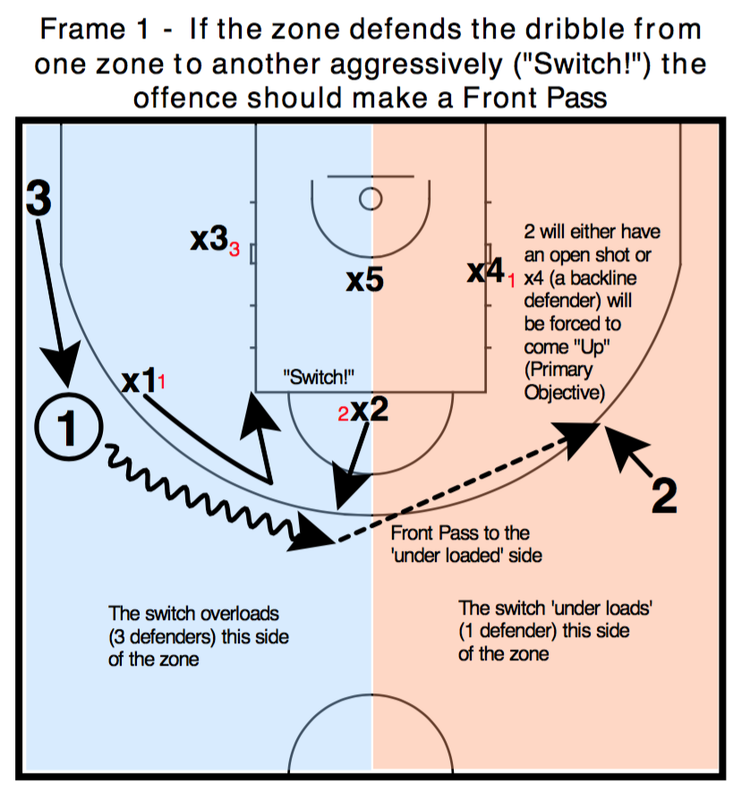 If the zone defends the on ball screen conservatively by following and dropping, the offence should make a Back Pass. 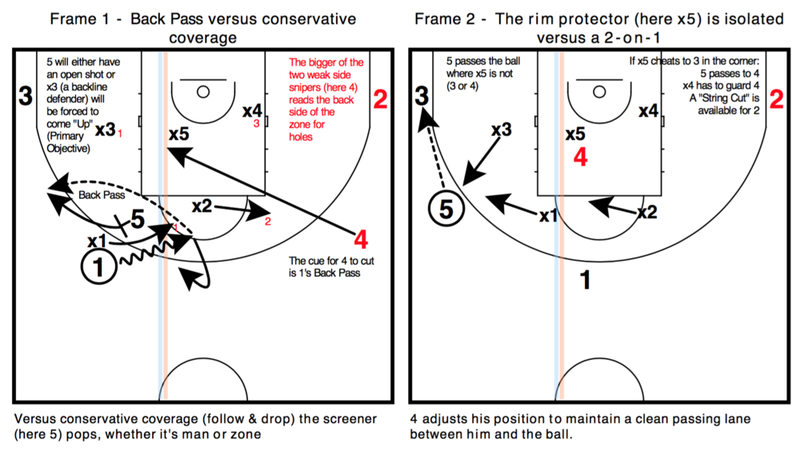 The read for the screener is the same as man-to-man, versus conservative coverage (the defender he screens will fight over) he wants to pop (provided he is a malleable big). If the screener is not malleable (a non-shooter) he will straight roll or dive versus conservative coverage (follow & drop). By maintaining the same on ball screen reads as used versus man-to-man defence the zone defence loses its mystique, negative transfer is minimised, your player’s thinking is reduced, and they’re able to maintain their certainty, confidence and aggressiveness. Oct 7 Using the re-screen to gain separation from the defender & create a "1 Side Back Side"